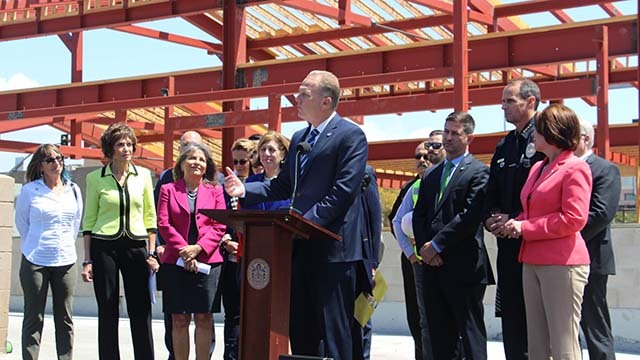 The proposed $3.8 billion budget that San Diego Mayor Kevin Faulconer unveiled Thursday includes the most infrastructure spending in city history, and prioritizes public safety, street repair and recreation centers, as well as initiatives to fight homelessness and illegal dumping. The spending blueprint also closes a $49 million deficit without significant cuts to major programs, according to the mayor. The budget proposal includes the largest recruitment and retention package in San Diego Police Department history, the equivalent of 390 miles of street repair and the highest level of library and rec center operating hours in a decade, according to the mayor’s office. It also reserves $153 million for initiatives related to the Climate Action Plan, including $121 million to advance the Pure Water San Diego water recycling program. The proposed capital improvement budget of $553 million, including $76 million for street repairs, would represent a large boost over last year’s total of $445 million, and triple the amount of infrastructure spending during fiscal year 2014. More than $28.3 million in proposed SDPD pay hikes would presumably help fill vacant positions within the department, and $666,000 would be earmarked for SDPD’s new Neighborhood Policing Division, intended to reduce chronic “quality of life” crimes often related to homelessness. The Vision Zero program, created to improve biker and pedestrian safety, would receive $18 million to improve sidewalk, signal and crosswalk infrastructure. City officials expect only modest revenue increases of 3, 5.3 and 5.5 percent from sales, hotel and property taxes, respectively, during fiscal year 2019. Faulconer proposes balancing the budget with $14.1 million in cuts across various departments, $12.3 million in projected surplus from the current fiscal year budget and $5.6 million in excess funds from select reserve accounts. City Councilwoman Barbara Bry, chair of the council’s Budget and Government Efficiency Committee, lauded the proposed spending plan. Faulconer will present the proposed budget to the council at 2 p.m. Monday, and the council will hold a series of all-day public hearings in May before adopting a final budget in June.